happiness and creativity!! 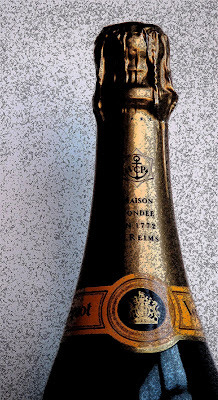 happy 2009! 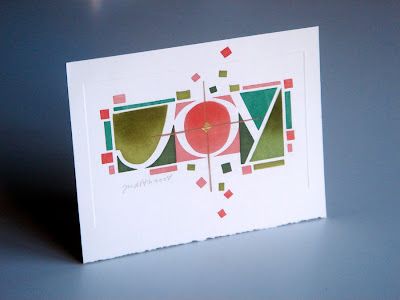 i received the most beautiful gift this year...a silkscreened card made by my friend judith! 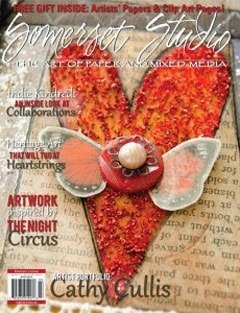 i met judith many years ago at a calligraphy workshop and immediately became aware of her awesome talent. 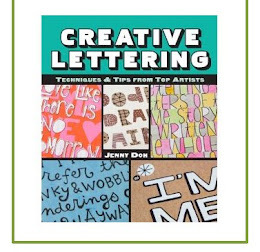 her letterforms are exquisite and her many years of graphics experience are apparent in every one of her fabulous designs. celebrating twenty-four years of being head-over-heels-crazy-in-love with this little dutch boy. he makes every day a "happily ever after day"... i am truly blessed. Wishing you love, hope and peace. 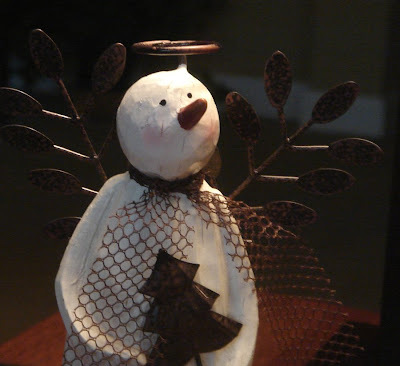 one of the "hazards" of living in north florida is that this little wooden snow angel is probably as close as we're going to get to having a white Christmas. and while i know in my head that most of you have been pounded with several feet of the powdery white stuff and are cold and miserable...in my midwestern heart, snow is supposed to go with Christmas. kinda like Rudolph goes with Santa, kissing goes with mistletoe, and chestnuts go with an open fire...snow goes with Christmas. i have so many wonderful childhood memories of making snow angels, having snowball fights, and of course, the neighborhood snowman building contests. it took us thirty minutes to get bundled up for a ten minute stay outside, but mom always had the hot chocolate ready when we scurried back inside, and somehow that seemed to make our frozen hands and nose worth the effort. so, i guess what i'm saying here is that, well, i miss the snow. and to answer your question...yes, i'm crazy. 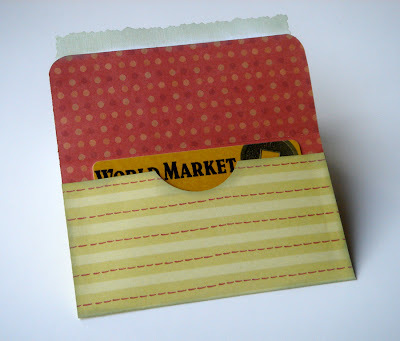 here is a quick tutorial for the gift card holder that i made yesterday. 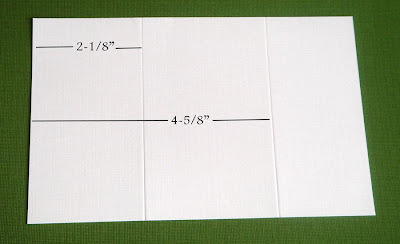 this works well if you use cardstock or other heavyweight paper. 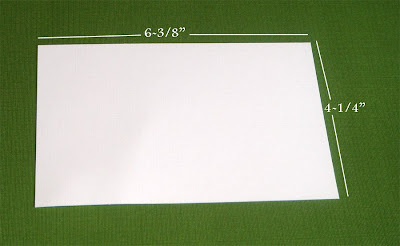 first, cut a piece of cardstock 6-3/8" x 4-1/4". 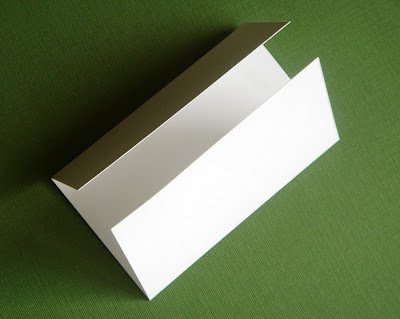 lay your paper as shown above, with the 6-3/8" side running horizontal. score at 2-1/8" and 4-5/8". fold at the score lines. using a bone folder helps to make nice crisp edges. on the end that measures 2-1/8" from the scored line to edge of paper, use a circle punch to punch a semi-circle out of the short end of the paper. if you don't have a circle punch, you can also trace around a spool of thread or other object and then cut with scissors. 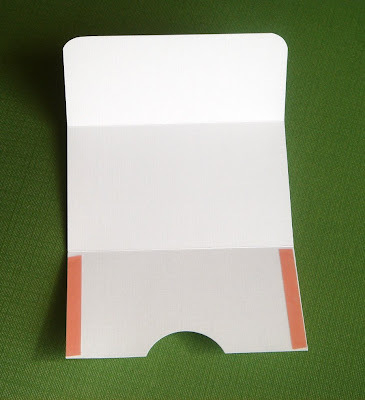 place red-line tape or glue along each edge of the paper until it meets the scored line. at the other end of the paper, i used a corner rounder to finish off the corners; you can also use scissors to round the corners. remove the protective backing from tape and fold paper up along the scored line, matching the side edges and making sure that the tape is secure. 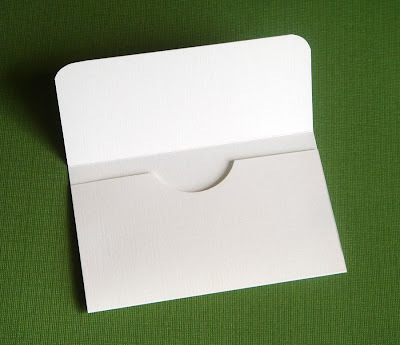 fold the top flap down and your card is ready to decorate! here are a couple of examples of card holders that have been finished...the sky is the limit here when it comes to decorating! these are super quick and super easy to make. have fun! how do you make a gift card pretty? 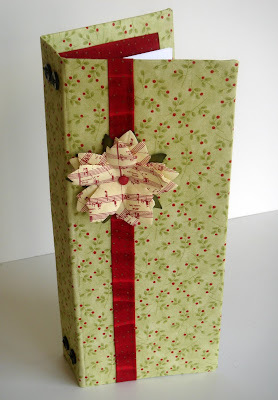 i think that a big part of the fun in gift giving is in the gift wrapping. but trying to come up with a creative wrapping idea for the ever popular gift card was a challenge. usually when you purchase a gift card, a generic holder comes with it...so i decided to modify it a little using some scrapbook paper. 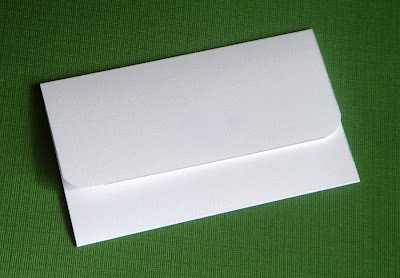 this is basically an envelope, but made with double sided cardstock. 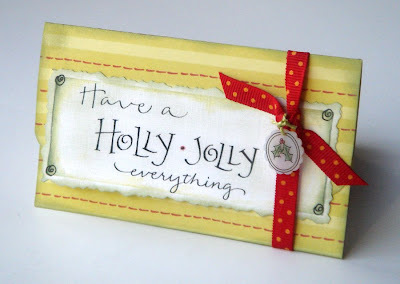 for the front, i used the lettering from my "holly jolly everything" cards and tied a ribbon around the card to keep it closed. 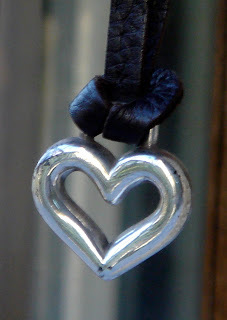 the little holly charm that's attached to the ribbon was made using shrinky dinks. 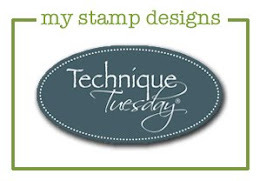 i'm putting together a little tutorial that gives the cutting and scoring information...i'll post it tomorrow! 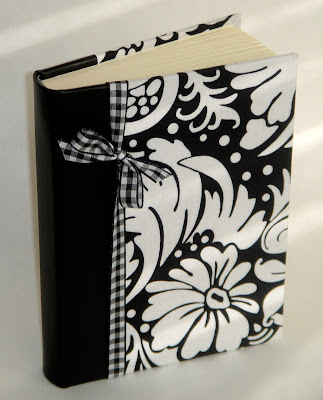 here's another book with a quarter binding that i made using some black and white floral fabric, and black leather for the spine. 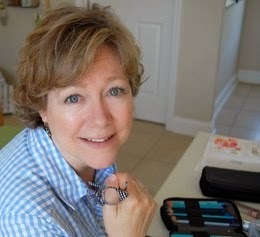 i had no book anxiety this time, mostly thanks to the wonderful feedback from my sweet blogger buddies tess and michelle...i SO appreciate your encouragement! and tess, thanks for sharing your momma's wisdom...she's right when she says, "Any slight flaw makes the item unique, It's only a flaw if you allow it to be." it's so true!! so, i think that this book might make its way into Santa's bag this year (and that's all i'm going to say for now, i don't want to give away any secrets!). i'm finally done with making gifts...now it's time to do some baking and wrapping...two of my favorite things! i must admit that every time i look at this illustration by mary engelbreit, i find myself chuckling. 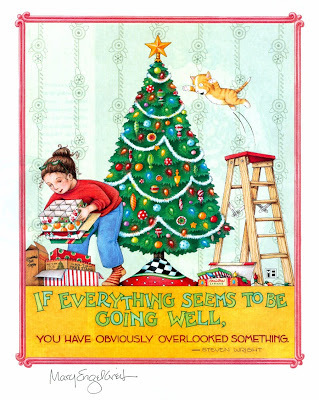 there's something about that cat doing a swan-dive into the meticulously decorated Christmas tree that seems to perfectly depict life at this time of year. and, if you're familiar with mary engelbreit's work (and you probably are), then you already know that illustrating our every day lives in a way that makes us smile is what she does best. 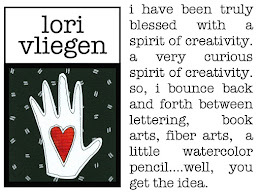 she creates from her heart...and has a unique talent of speaking to ours. 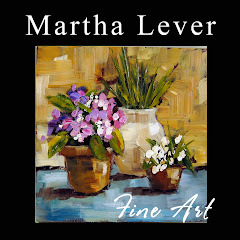 through her whimsical style, she states the obvious, and she's able to make cherries, checkerboards and art deco flowers fun. one of the many wonderful things about being a mom is that you get to brag about your kids....and today i'm bragging big! 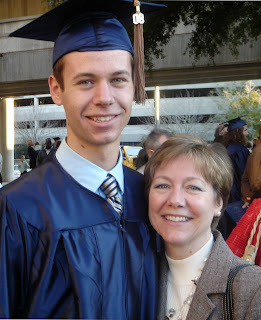 our son Spencer graduated from the university of north florida yesterday! over the past four years, he has completed a semester at the university in cologne, germany as part of the study abroad program, kept up with a part-time job, completed an internship, and has earned a bachelor's degree in international business! "how beautiful a day can be when kindness touches it!" thank you, everyone, for making my days beautiful...because when you peek at my blog from time to time, i feel your kindness. i'm especially thankful for all of the wonderful comments that you leave. i SO appreciate your willingness to share your wisdoms with me. you have encouraged me in ways that i could never express! thank you so much for giving my artwork a purpose. i have such a soft spot for anything classic, so when i spied this houndstooth fabric in the store, i just had to have it. 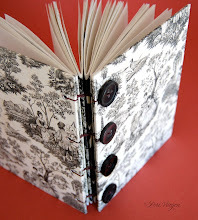 i thought it would be perfect for this book, which was bound using a "quarter binding" (it's called a quarter binding because one quarter of the cover is bound using bookcloth...except for this book i used black leather). 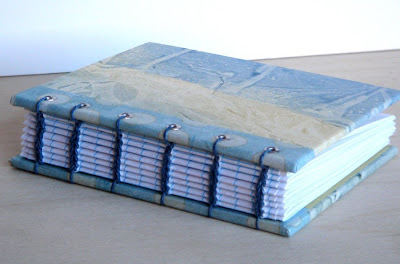 this is my first quarter binding and i love the way it looks...except for one major thing. 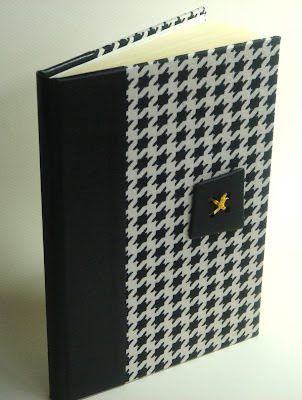 when i finished binding the book, i noticed that the fabric seems to be crooked just at the top and bottom. 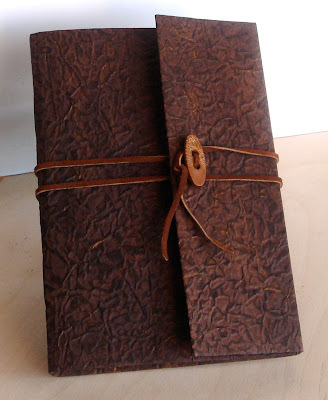 if you look at the front edge of the book, and where the leather meets the fabric, the pattern of the fabric is straight. if the sides are straight, how then can the pattern be crooked at the top and bottom?! do you think it was just printed that way? do things like this really bother you too, or is my type-A personality just rearing its ugly head? the irony of it is that i really like the book...it's just that now my eye goes straight to the crookedness of the fabric every time i look at it! well, i'll wait to hear your opinion before i judge it any further...please let me know what you think about this! 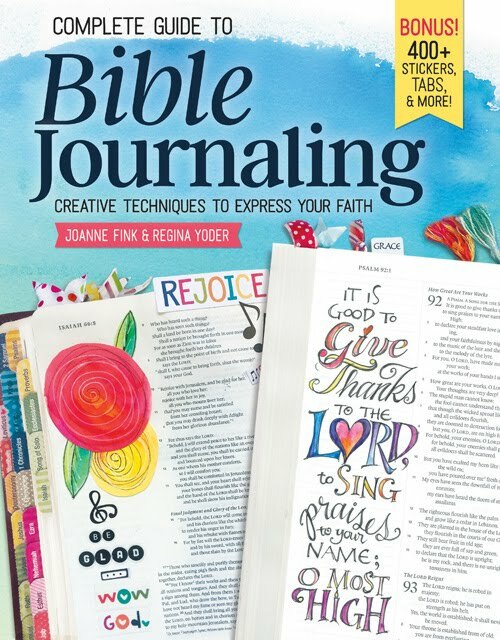 it's hard to believe that five weeks have gone by since i began my online journal class with sue bleiweiss! 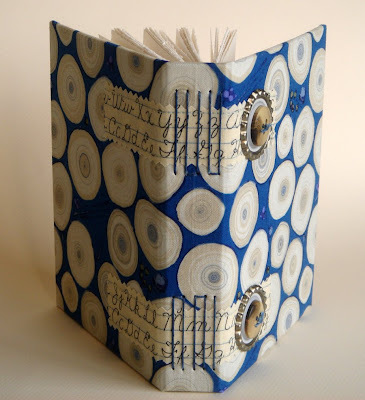 this is my final project...a fabric book that's bound in a way that allows pages to slide in and out as you need them. actually, i should have done this last week, but i got too busy and even considered waiting until january to complete it. and then i decided since i can add pages as i go, this would be a great book to house all of this year's holiday cards. 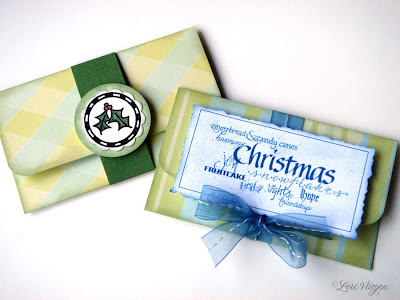 i've placed some Christmas paper inside and tucked in some of the cards that i made this year. it's the most wonderful time of the year. inspiration is all around us. the craft magazines are filled with great "make-it-yourself" gift ideas, and martha stewart is a never-ending source of decorating enthusiasm. and to be honest, if i'm not careful, i tend to get "inspiration overload", mainly because i have a million ideas on my to-do list, and i want to do them all...by tomorrow. so when i start feeling that twang of overwhelm, i step back and do something totally traditional. 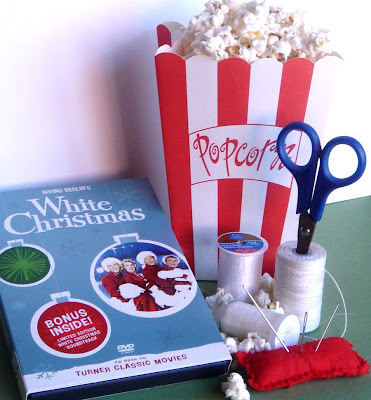 and tonight that means a good ol' bing crosby movie and some popcorn, not just for eating, but also for stringing. it's time to decorate the tree, and this year i'm inspired to borrow from my childhood and do it the old-fashioned way. what's old is new again...who knew that orville redenbacher could provide so much inspiration? 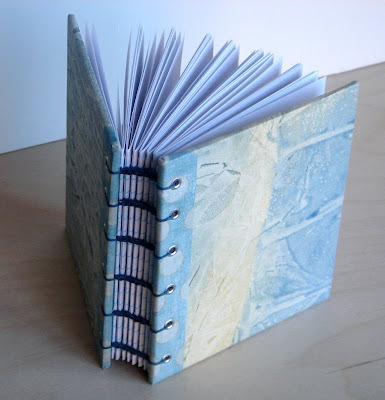 i've been wanting to make some books with a coptic binding for quite some time now. and i've discovered that like most things, it takes a lot of practice. so, i've been practicing. and practicing. and now that i'm working through my tendency to pull the stitches too tight, those little chain stitches are finally starting to look a little more consistent. my husband returned home last night from a trip to belgium to visit his family. 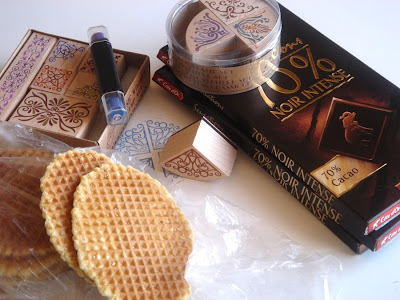 look what he had in his suitcase for me...yummy dark chocolate, two rubber stamp sets, and mouth-watering waffle cookies made by his tante marie-elise! does this sweet little dutch boy know the way to my heart, or what?! sometimes i fall in love with a fabric, but that doesn't guarantee that it will look good on a journal (kinda like when i go shopping and that "to die for sweater" looks better on the hanger than it does on my body). 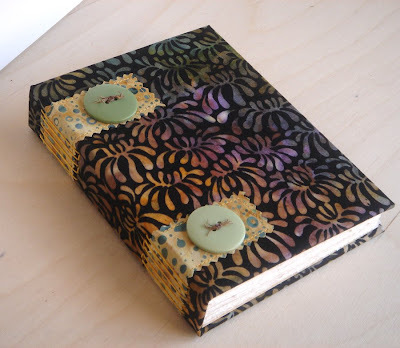 today i got lucky...i think that this batik fabric is the perfect fit for this journal! 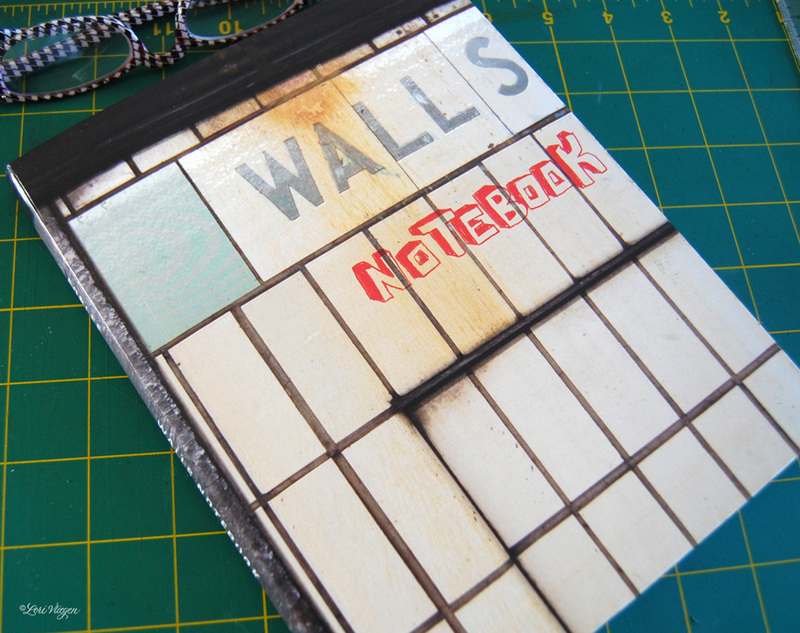 would you believe that the cover of this journal started out as a paper bag?! 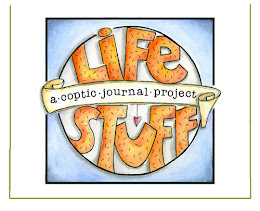 this is the fourth project in my online journal class with sue bleiweiss. the wrap-around construction is similar to that of our project from week one, but this time instead of using fabric for the cover, sue taught us a technique using a brown paper bag. and it seems that not all paper bags are alike...i used a lunch sack because it's a little lighter in weight, but i think that next time i'll use some of that brown craft paper on a roll (the type that's used to wrap packages). 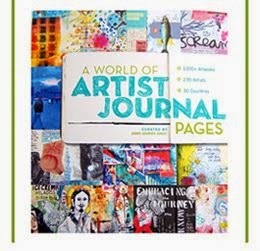 it's much heavier in weight and it would be interesting to see the difference in the two journals. 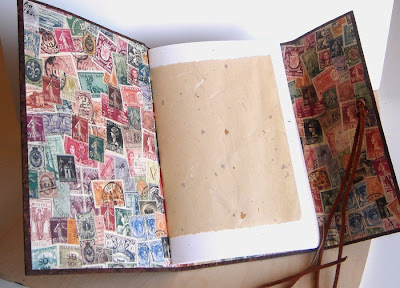 for the inside cover, i used a piece of decorative paper that has a collage of postage stamps all over it. i also wrapped a smaller piece of handmade paper around each of the three signatures, just to give it a little interest. 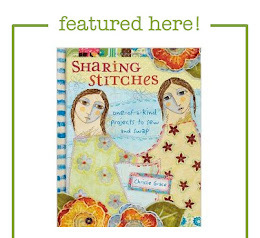 just like my other projects with sue, this was a fun book to put together. 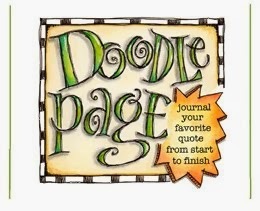 i'll keep you posted on my next journal! the tag line over at little brown pen reads: just. add. paper. 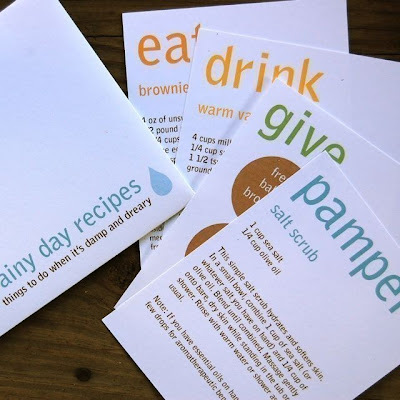 it's perfect because this is an imaginative company that offers fabulous printable stationery and gifts! but after frequent visits to little brown pen, here's what i'm thinking: pure. simple. genius. 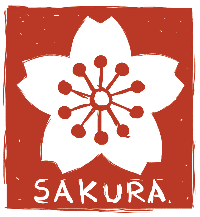 the pure and simple are in their sweet, colorful, eye-catching digital designs. and the genius (actually, geniuses) behind the operation are evan and nichole robertson. 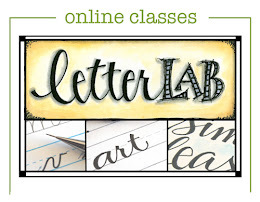 armed with adobe illustrator and a ton of cleverness and creativity, evan and nichole create stationery, bookplates, calendars, and gifts....all sent to you in a printable pdf file. 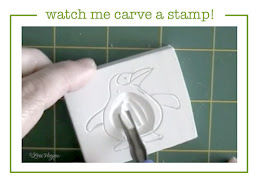 which means that you can print them, cut them, fold them, and give them as many times as you like! this is a whole new spin on "the gift that keeps on giving"! need a gift for your babysitter? done. want to give a little something to that nice man who does your dry cleaning? done. this is inspiration at its very best! this video shows how easy holiday gift giving can be this year. it also illustrates how much fun evan and nichole are having making little brown pen the success story that it truly is. click here to be inspired...but i must warn you, it's addicting. 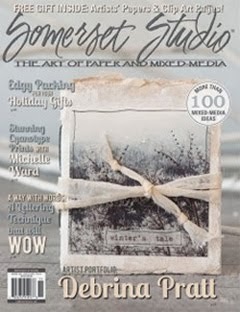 and treat yourself with a visit to their blog ...beautiful photography and great information! thanks evan and nichole...you truly inspire me!